P-TECH is an innovative educational model, which originated in Brooklyn, New York in 2011 and has since expanded across the US and internationally. 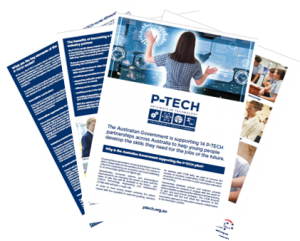 The Australian Government has invested $5.1 million to pilot the P-TECH model in Australia, and has engaged Skilling Australia Foundation to assist local stakeholders to work together to implement P-TECH learning programs at all 14 pilot sites. Ten P-TECH partnerships are currently operational across Australia with four new partnerships to commence in 2019.